Our oceans are filthy with plastic. Most attention so far has focused on the bottles, carrier bags and other junk floating in the middle of our oceans. Some say that we ought to go out there and clean the stuff up. But a series of recent high-profile studies suggest that this stuff is only 1% of all the plastic in our oceans. The question is, where is the other 99%? It’s hard to imagine a life without plastics, and this awesome material has greatly advanced our standard of living. However, some of this plastic ends up as waste in our ocean, where it clearly doesn’t belong. A recent inventory in the journal Science estimated that around 10 million metric tons of plastic entered the ocean in 2010 alone. However, two independent surveys have found that all the plastic bobbing around on the surface of the ocean weighs less than 100,000 metric tons. So the amount of plastic at the ocean surface is two orders of magnitude lower than the amount of plastic that entered the ocean in 2010. Even with the large uncertainty margins on all these estimates, the conclusion must be that most of the plastic in the ocean has gone AWOL. There are not too many places where the remaining plastic can be. It’s either on the seafloor, in the stomachs of animals, or on shorelines. The problem is that we don’t even have ballpark figures of how much plastic is in each of these places. We know that there is probably a lot of plastic on the seafloor, where it impacts small critters crawling around. Not all plastic is buoyant enough to float, so some of the plastic will sink very quickly after it enters the ocean. Other plastic may float for a while but over time become so heavy with algal growth that it starts sinking. Unfortunately, we have only a few localised samples of plastic on the seafloor, and no idea how to scale these up to the entire ocean. The second reservoir, inside animals, is probably the most worrisome of all. Most plastic that enters the ocean gets fragmented by wave action and sunlight, and after a few months to years ends up as tiny microplastic pellets. These tiny pellets might be quite easily ingested by large plankton and small fish. However, once again we have no clue how much plastic we are talking about globally. The shorelines, finally, would be my personal bet on where most of the plastic ends up. My own research at the Grantham Institute has shown that currents move plastic around in complex ways and it can linger near the shore for months. 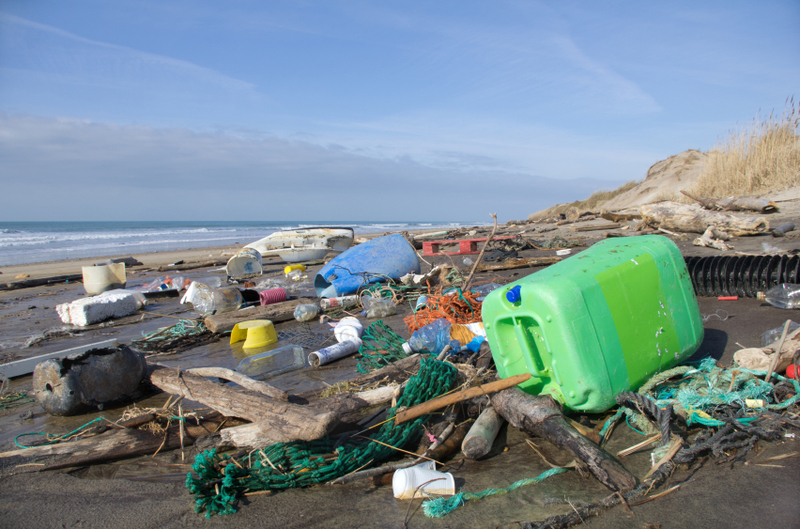 Much of the plastic that enters the ocean could just wash up with the next big storm. Shorelines come in many forms, from beaches to rocky outcrops to mangroves, and most of them are very remote and littered with plastic. Even the seemingly clean ones here in the UK might actually receive a lot of plastic, but volunteers and local councils clean them up at such a rate that we don’t realise just how filthy they are. There are great apps to report plastic on beaches, and widespread use of them would really help science. We need to know where our plastic ends up if we want to understand its impacts on marine animals and ecosystems. And crucially, we need to stop polluting and remove plastic waste as close to the source as possible. Engineers are starting to think about how to do this with contraptions such as the Baltimore Waterwheel, but more bright ideas are needed. If the case of our missing trash shows us anything, it’s that plans to clean up the floating plastic in the middle of the ocean do not really address the biggest problem. It would be far more effective to make sure no plastic ever enters the ocean in the first place. A stitch in time saves nine. You have to consider how the plastics degrade and the rate of decomposition. The marine environment close to the surface is conducive to breakdown by abrasion, chemical and UV degradation. Larger and denser fragments may sink and much of it enter deep water beyond the continental shelves where it will eventually comprise part of the sediment layer. The nature of the plastic is also significant and the bulk of it is hydrocarbon based and relatively innocuous. Agreed, though, more research is needed!